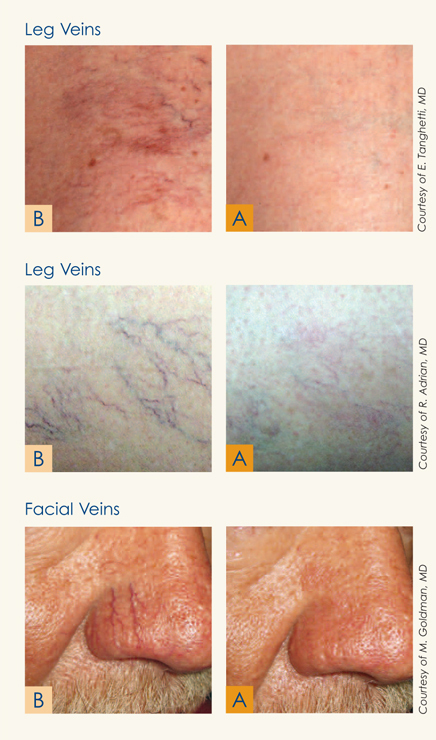 Remove leg and facial veins with cosmetic laser treatment. Leg and facial veins are bothersome at best, unattractive at worst. Fortunately, with cosmetic laser treatment, you can make yourself look and feel a whole lot better often times, with as little as only one or two visits. Red, blue or purple leg and facial veins can be a result of sun exposure, use of oral contraception, hormone therapy, age or genetics. A cosmetic laser emits a prescribed dose of energy to the vein. The laser "selectively" targets the problem veins while sparing surrounding areas. After treatment, the vessel will naturally disappear. Typically only one or two treatments are required and results can be seen in 3-4 weeks. Treatment time usually varies between 10 and 20 minutes, depending on the size of the area treated. The treatment causes only minimal discomfort. Any redness or swelling should be gone within a day and you'll be able to resume normal activities immediately. For any other concerns or queries you may have about our skin lesion removal,, please visit our contact page to get in touch with us. Leg and facial veins are bothersome at best, unattractive at worst.